This purchase allows you to read Sweet Paul Spring 2019 on issuu.com anytime. It does not include a printed copy of the magazine. 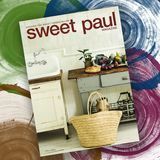 Sweet Paul Magazine offers a discount when you purchase upcoming issues in advance. You will get access to new issues on a quarterly basis.